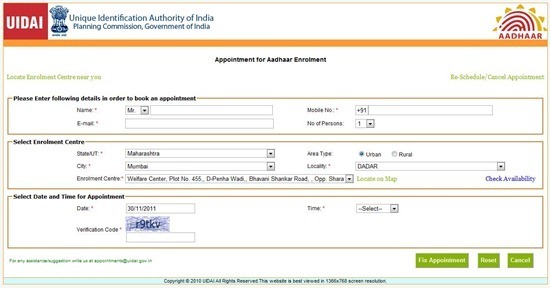 Applying for Unique Identification Card (UID) just got easier – Unique Identification Authority of India (UIDAI) has launched a new online service where citizens will be able to book appointments for UID card. This is really going to help lakhs of users across the country – Currently, users have to travel either to General Post Office or a UID center in their area and book appointments. However, majority of them do not know the addresses or the numbers of UID centers. Although, the news says, it is available only in Chandigarh currently, it seems that more states and centers are being added constantly. Many towns / cities in Maharashtra, Punjab, Haryana, Himachal Pradesh, Chandigarh and Delhi are listed. If you are one of the states above, head to http://appointments.uidai.gov.in/ and book a appointment online as per your convenience. If your area is not listed, you may want to wait for some more time as UIDAI is adding new states and cities continuously. The response to UID registrations till now has been quite luke-warm at best and one of the main reasons has been accessibility to UID centers. But with this new initiative, things may change. It is important though that online appointments should be extended to more cities faster! This online appointment should have been launched earlier itself – But better late than never! what say? it is absolutely non-sense having an appointment on line, last 3 days i have trying to book an appointment but all the slots are getting packed even at 12:15 midnight. and it does not allow to lock beyond 30 days. and not only 1 location but all the four locations in MUMBAI urban. I have been trying for an appointment since 2 weeks at Vashi sec17 Navi Mmbai but I cant get an appointment , According to the online booking appointment can’t exceed 30 days, but appointments are booked upto 18th of March i:e more then 30 days. How is this possible ? Do I have to bribe the officials sitting there? I went straight to my center in Vashi and argued about the appointments being full and they immediately accepted my form and got myself registered. I want appointment for my family of 4 persons at powai or sakinaka area. My cell number is 9324062554. I want appointement in Kalyan west in IDBI Bank on or before 31st Dec.2012. Please give me token for UID. They have not started Appointments cause UIDAI can't handle the crowd already in almost every place enrollments are started. This appointment thing will be useful when intial rush is handled. Yes, I too don't understand why government websites are so badly designed.